Anybody in for a quick summer pasta? Mozzarella, Chicken, Protein Plus Pasta, Fresh Basil, Garlic, Roma Tomatoes and some TLC. Wow, look at those grill marks. We got some parmesan chunks at Costco. We froze 2/3 of it and are enjoying 1/3 of it now. I got an afternoon text asking if I'd be in for a trip to the Tuesday Farmer's Market Downtown and a bite to eat at our favorite burger joint. For a few seconds I thought, oh man I have a lot tonight, I'm not sure if we have enough time. And then I thought, well it might be good to break up the week a little. We live just far enough from downtown now, that we can't make it there on bikes quickly, but we like to bike in to avoid the parking mania. So we loaded the bikes into the back of the truck and parked downtown, but not too close. We still needed a good 10 minutes of pedaling to get the leg muscles working. 25 degrees the restuarant was buzzing, just like the rest of the market Not that great of a picture, I got shy when it came time to take the pic in the restaurant, I feared looking like a tourist. A couple years ago when they started the tuesday street fair night, the local businesses were complaining that it took business away from them. From what I can see happenening now, these nights bring business to the area. We hadn't been down there in a few months, and you could definetly tell that summer had begun and the kids and travelers were out. It was the most crowded I had ever seen there. The front pic is fried green and yellow green beans. They were pretty tasty. Behind those, you will see a plate of bacon wrapped dates. These bacon wrapped dates are nothing short of incredible and amazing. You can't help but stop and take a moment to enjoy these masterpieces while they are in your mouth. We asked for the special sweet sauce that they used to serve it with and this appetizer was to die for. With the double appetizer, the last thing we needed was a whole meal. We settled on splitting the ahi tuna burger. I substitued the fried crispy onions for grilled onions. I also ate about half of my bun. The fair has grown a tremendous amount, and there was the cutest boy band playing on the corner www.uglypaint.net we listened to them play for a few minutes and then moved onto the market. With everything going on, the veggie shopping was not the center of our trip, as eating and indulging took the place. I'll make up for it this weekend and get some yummy veggies in the house. We ended up only buying a couple white peaches and the threw in some free apricots. We stumbled upon the cutest little cupcake stand and got this taster of cupcakes. Turns out she is opening a shop down the street from our house, so we may be in for a treat every once in a great while. We ended up only tasting one and saving the other two for tomorrow. Hope you enjoyed the longest day of the year today. The consumer-friendly website, http://www.fruitsandveggiesmorematters.org/, offers tips, recipes, and meal planning advice geared towards meeting the goal of making half your plate fruits and vegetables easily achievable. While on the http://www.fruitsandveggiesmorematters.org/ site, consumers can take the America’s More Matters Pledge: Fruits & Veggies . . . Today and Every Day! The America’s More Matters Pledge encourages everyone to make fruits and vegetables half of daily meals and snacks or to simply increase the amount eaten each day because more does matter. The tools needed to follow through with the half-the-plate pledge are also available on the http://www.fruitsandveggiesmorematters.org/ website. The site includes a recipe database with over 1,000 recipes, many that can be made in 30 minutes or less, and a Video Center loaded with informational and entertaining short clips that offer fruit and veggie selection and storage and preparation advice and techniques. Follow Fruits & Veggies—More Matters on Facebook or Twitter to get the latest news on America’s More Matters Pledge: Fruits & Veggies . . . Today and Every Day!, Fruits & Veggies—More Matters, and Half Your Plate. About Produce for Better Health FoundationProduce for Better Health Foundation (PBH) is a non-profit 501 (c) (3) fruit and vegetable education foundation. Since 1991, PBH has worked to motivate people to eat more fruits and vegetables to improve public health. PBH achieves success through industry and government collaboration, first with the 5 A Day program and now with the Fruits & Veggies-More Matters public health initiative. Fruits & Veggies-More Matters is the nation's largest public-private, fruit and vegetable nutrition education initiative with Fruit and Vegetable Nutrition Coordinators in each state, territory and the military. To learn more, visit http://r20.rs6.net/tn.jsp?llr=4jbk78bab&et=1105476934546&s=13&e=001QcH6AOkoITG5OWzGUMQiaNwvE-KHY-2p9liGZD8-LHPCG8-j3xPsarNZ4M7Zg426248TAkp8xILu2hij6HS8_aBzIsS-AOVlEe3paO3yYtNYtQg3IW_TQQ== and http://r20.rs6.net/tn.jsp?llr=4jbk78bab&et=1105476934546&s=13&e=001QcH6AOkoITFZGLTzlsmS3SBd745Z1Q7hHhx-3UzbumGlO1UryehJ-1CA5AzvI2F4FbxFHRYVvlDQPqopj6LapxH5PTVUa-9MdEcbcs0fcXbF4Ubw_z2dZ9X_AnIWJ8GMvaeGpwTBtRU=. Follow Fruits & Veggies-More Matters on Facebook or Twitter. PBH is also a member and co-chair with Centers for Disease Control & Prevention (CDC) of the National Fruit & Vegetable Alliance (NFVA), consisting of government agencies, non-profit organizations, and industry working to collaboratively and synergistically achieve increased nationwide access and demand for all forms of fruits and vegetables for improved public health. To learn more, visit http://r20.rs6.net/tn.jsp?llr=4jbk78bab&et=1105476934546&s=13&e=001QcH6AOkoITGLfTJ8rA9DJD7522c1cBo1V8RlES2YkLl66BJFm0umVHz1MZ1pQW2WS59yrtMO-4GvAEa7KcZHTd1BWz8Nee23b403rkUPwg0=. It is mid Saturday and I have been running around hunting, searching, gathering for most of the morning. I always seem to have something on my agenda, even on a no plans day. I made it home with one minute to spare (for the dryer repair man) and was ready to pass out from hunger. Well not quite that bad, but I did do a no-no and set out at 8:00 and brought zero snacks.. I was able to make it with only stopping for a green tea and a V8. Note to self, stash more protein bars and almonds in the car. Back to the task at hand, in the 5 minutes that I had to spare while waiting for Mr. dryer, I whipped up a lunch and it was far healthier than anything I dreamed of stopping for for the 2 hours prior. I was glad I waited for a whole food and home cooked quick "make up as you go" meal. It ended up being a toasted whole left pita half, stuffed with half of a left over grass fed hamburger patty and a mediterranean egg salad. * I was still hungry, so I had a bowl of plain greek yogurt, a cut up peach, almonds and a drizzle of agave nectar. *The egg salad that I made, (I am lucky enough to be able to buy homegrown organic eggs from a coworker, and he just brought me a new batch, so I needed to make room for some more.) I happenned to have 3 eggs already hard boiled, perfect for a couple batches of salad. I hunted the fridge high and low and the mayo was no where to be found. It appears that someone who shall remain nameless, but the only other person that lives here with me, used all the mayo without putting it on the grocery list app or buying it. I took a deep breath and composed myself, and thought about how else I could make this salad. I decided on adding plain yogurt and this mediterranean oil and herb mix. (I wish I could remember the proper name for it, one of Mr. Nameless's students brought it for him to try and we've been enjoying it every since) If I don't say so myself, this may be the new way to go for egg salad sandwich, who needs mayo anyways. Not me, often. I have gathered some photos of plates that have been whipped up in this house, minutes after walking through the front door. I like to call these fast food aversions or 5 minutes or less. I honestly stared at this photo for a few minutes, wondering what in the world was on this. I believe it is: whole wheat toast, goat cheese, chicken patty, grilled onions and mushrooms, & tomatoes. The chicken patty is precooked and can be from freezer to plate in 5 minutes, the onions and mushrooms must have been left over from a previous night. I grill those up sometimes, just to have. This is a steak taco. The steak was left over from a previous meal, and I added tomatoes and avocadoes and salsa after the photo I imaigine. Oh, apparantly one more picture to show that I added an orange to make it a meal. Now I will admit, this is quite the odd combo and more like a snack. But what this does show is whole foods. This is a whole banana, a whole nectarine, and whole small piece of chicken and I have a small meal or a snack. Nothing processed here, nothing that has a package with ingredients on it an inch long. Another taco here, this time we have chicken patty on it. Find a patty that you like, has the right price, has the lowest sodium, and not a laundry list of ingredients and use it. Protein is super important. Cucumbers, tomatoes, and hummus. Probably a little salt, pepper and EVOO. Quick salad with ground meat, and a side of brussel sprouts. If you cooked the meat and brussels ahead of time, this is a quick throw together. 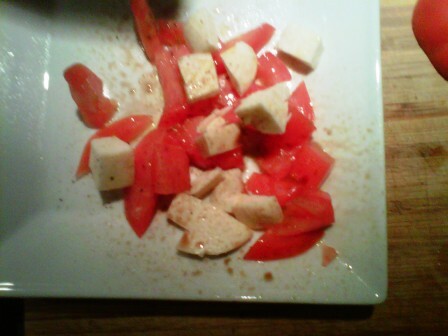 Tomatoes, mozzarella, olive oil, balsamic vinegar, & pepper. This has been Eat Well, Play Well, Quickly & without a recipe.